Image: Yang style application - this Tai Chi Chuan application is rather typical of martial applications that run through all of the styles of Tai Chi Chuan. Fu Zhong Wen with graduate's of his very First Yang Style Push Hands class, Hong Kou Park, Shanghai. Fu Zhong Wen, Yang Chengfu's nephew is standing sixth from right, famed Nei Jia Kung Fu (Taiji, Xingyi, Bagua) teacher, Zou Shuxian is standing sixth from left on Fu's right side. Fu Zhong Wen, 5th from right, and his closest students welcome Yang Zhenduo, Yang Chengfu's son (4th from left), when he visited Fu in Shanghai in 1964. Nei Jia adept, Zou Shuxian, 5th from left. We are now five or six generations removed from Yang Luchuan. We are likely even several generations removed from Yang Chengfu, who left behind the most far reaching, popular take on Taijiquan. What is the state of modern Yang style? I firmly believe that what we see today practiced within the lineage of Yang Chengfu (Yang Zhengpu), and I'm speaking most directly about Fu Zhongwen and members of the Dong Family, is essentially what is left of the original Yang form. These versions of the Yang form that are practiced by legitimate close students and family members of Yang Chengfu are very similar to each other despite their differences. This doesn't mean that there aren't more complete remnants of Yang Luchan's original style sprinkled throughout the world somewhere. But, in my opinion, claims that persons escaped to Hong Kong, Taiwan, or the west with the only surviving real, authentic Yang Style are pretty much bogus. This is true even for people who can be verified to be associated with the Yang family by blood or by studentship. It is more likely that much of what is now presented as the original form of Yang Luchan has been invented (or) reinvented even if there are surviving aspects from an earlier form. This is my opinion based on my experience. What makes this more problematic is that we don't know all of the students of Yang Chengfu: it is therefore impossible to reject claims of lineage through Yang Chengfu, just as it is for any other member of the Yang family before him. But lineage is not all there is to authenticity. There is no real assurance that there is a correlation between the reputation of your teacher, their skill level and the ability to teach. Fu Zhongwen's group, the Dong family and other close students of Yang Chengfu are engaged in similar practice. The main exception to this congruence of the teachings of Yang Chengfu's direct students is the group that follows the teachings of Cheng Man Ching (Zhang Manqing). I feel Cheng Man Ching developed the style he had studied from Yang Chengfu in Shanghai for over eight years to emphasize the internal aspects of Yang Chengfu's practice. Yang Chengfu was a large man. When he did Grasp Bird's Tail, for example, he didn't hold the hands up at nearly shoulder level as you see so many do. Instead, when Yang Chengfu performed Beng, or Ward Off, his hands ended up where they did because of his shear size. The Tai Chi principles dictate the shape, but Tai Chi practice is performed by individuals. Cheng Man Ching did the same thing, emphasizing the principles to dictate his shape but making his practice his own by also applying his emphasis on internal principles. This is where some of his followers and grand students have gone off the deep end by emphasizing what they consider internal principles over any shape whatsoever. Consequently, instead of practitioners who support shape with internal power, you are left with a lack of shape with exposed internal power. This is why we often see the push hands from this camp decaying into wrestling: without a good stand up approach to body structure, the tendency is to bend and break the structure. That doesn't make for good push hands (or good wrestling for that matter). We have many of Cheng Man Ching's followers evolving toward a practice that follows less and less of the Tai Chi Chuan structure and principles. As I have stressed elsewhere, a student must make Taijiquan his own to achieve mastery. There is room for debate if Cheng Man Ching passed down a substyle within Yang style or if he created his own new style. In my opinion the best students of Cheng Man Ching's lineage are obsessed with a less is more approach to the internal practice of Taijiquan. They divorce themselves from concerns about the outward appearance and focus on the inward movement of energy. The worst students of this lineage fail to grasp the shape and structure that the practice of T'ai Chi Ch'uan requires. Two of my teachers, Zou Shuxian and Zhou Yuan Long studied with Fu Zongwen. 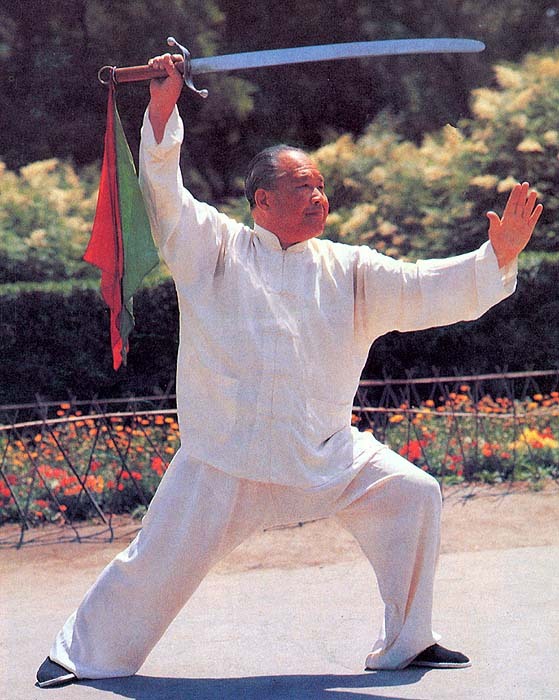 Zhou Yuan Long was particularly taken with Yang style as a balanced middle ground between the complexity of Chen style and the minimalism of Wu (Chian Chuan) style Taijiquan. Consider the group of that follows the practice of Fu Zongwen's lineage. Their version of Yang style also is concerned with internal practice, but they want to achieve this without sacrificing shape and structure. It is easy to see the choices that the teachers made through the practice of their students. Fu Zhong Wen was Yang Chengfu's nephew through marriage. He traveled with him everywhere: Hong Kong, Tianjing, Beijing, etc. It was Fu though that authored the most popular book on Yang Style, Mastering Yang Style Taijiquan. The drawings used in this book were done by Zhou Yuan Long and have been widely copied. He did most of them based on the actual photographs that were taken of Yang Chengfu in the 1940's. Fu Zhongwen felt that some other postures were either missing, or that in places more drawings would help the reader to understand the shapes. These postures were then performed by Fu and sketched by Zhou. Now with the popularity of Yang Zhenduo in the West, many are not aware that Yang Zhenduo was eight years old when Chengfu passed away. It is common knowledge among those of that generation that Yang Zenduo learned his Taiji from his Uncle Fu Zhongwen. There can be little doubt that Fu's book not only influenced Zhenduo, but also an entire generation and the subsequent generations who claim that they have a lineage with any member of the Yang family. I base this on the reference to the Ten Essential Points that Fu Zhongwen attributes to Yang Chengfu: they are found almost exclusively in Fu's book - certainly no other book predates it with such a reference or stark detail. Consider the example of the Dong style. The family teaches legitimate Yang style. The Dong family version of Tai Chi is a relatively direct sub-style of Yang Chengfu's teachings through one of his better-known students, Dong Ying Jie. Some of the choices that the Dong family has made include their own fast set and a particular way of stepping. There are a number of ways to implement this stepping method in ways that are completely consistent with the principles of Tai Chi, Yang Chengfu's teaching, good body dynamics and effective martial arts practice. However, this stepping method in the Dong form has been taught locally, especially in Southern California, by a large number of people (who may or may not have any direct connection with the Dong family) that have introduced an error that is not consistent with Tai Chi principles, has poor body dynamics, and is essentially an ineffective martial arts practice. A significant number of people seem to have damaged their knees and other joints in this practice: we have a significant number of Tai Chi teachers with knee and other joint problems that seem to be a result of this sort of error propagation. In my view, this is not a direct result of the faulty transmission of students, grand students, or great grand students for that matter of Dong who have helped to spread the T'ai Chi Knee infliction. A lot of that blame must rest on the government styles developed by the Chinese government in the late 1950's. An error has been introduced by one or more people who taught Dong style and - like the child's game whispering down the lane - the error has propagated without correction, displacing correct practice. This is an error that could have been corrected if a larger number of the students had reasonable martial practice. There are many such examples that run throughout Yang style as it is now generally practiced. I feel that legitimate Taijiquan ought to be practiced without sacrificing shape and substance. I see more and more evidence that shape is being sacrificed for substance, or substance is being sacrificed for shape. In the short term, there's a lot to be gained internally by sacrificing shape. In the long run, this choice causes subsequent generations lose substance because the core shape eventually gets discarded. It is even more complicated than that, because there is no longer a legitimate venue that offers a martial arts challenge match to weed out the weak kung fu teachers - or help establish a pecking order. This is even true for mixed martial arts and tournaments: the UFC is hardly a real venue with their approach to their rules. (Some superior fighters have been disqualified or have lost matches due to these rules. These rules can eliminate the use of elbows or other sorts of actions. Other times, competitors have dropped their opponents on their head by using sweeps or throws but, because of the dopey, unnatural slick tournament surfaces, their opponents have survived such falls only to win.) These mixed martial arts matches take every precaution to create a the appearance of a real environment only for their rules to drive unrealistic scenarios to play out. Issues related to rules are far more pervasive in so-called push hands or Taiji tournaments. Especially in Taiwan and China these tournaments have created many champions that couldn't fight their way out of a wet paper bag: these champions win these matches because they know and exploit the rules of the events. I am speaking from personal experience, as I too have won at tournaments in both China and the U.S. and I can tell you the majority of all tournaments fail to choose the best. The tournaments are generally driven by politics or rules. I've been in tournaments where I shouldn't have won and did, and been in some I should've won that I lost. Many of the judges in tournaments are renown for skills they do not have: some of the judges have no background in T'ai Chi at all. This doesn't take into account that it is almost impossible to differentiate between authentic and fake T'ai Chi by visual observation. Contact is necessary in evaluating internal martial arts because nearly all people, (experienced or not) cannot see the difference between a teacher engaging legitimate attacks and a fraud whose students or friends are making things look good by cooperating. More fundamentally, T'ai Chi was never meant to be a competitive art. Some so-called champions try to convince others that the competition sent them to new heights. Yet T'ai Chi's arsenal of applications is based on non-competitive ideals such as Yield to Overcome, Invest in Loss, Follow -- Yet Arrive First. The object of T'ai Chi practice with a partner is not to highlight the differences in their ability, but to advance the practice of both partners to a higher level. The martial aspect of T'ai Chi Ch'uan recouples the esoteric parts of the art with reality. Win or lose a fight, there is an inevitable emphasis on substance. Without the martial component of T'ai Chi, errors are likely to be introduced and propagate unchecked (even with the best of intentions or the most carefully considered cirriculuum). This style at the expense of substance approach is my view of the impact of contemporary Wushu artists in the development of the 24, 48, 88, and 42 forms. (Typically these are government style or competition 24, 42, 48, and 88 and sword forms like the 32 and 42. To confuse the issue even more, there are some legitimate Taijiquan styles that use these number based names for their versions of traditional forms, including some recent simplified forms.) There are a small number of teachers that can stay true to the substance of Taijiquan when they practice these government-style or "competition" forms. In general, there is no substance -- no connection with the basic principles of Taijiquan as described in the classics -- when the practice of these wushu versions of T'ai Chi Ch'uan forms are compared with a traditional approach to the forms. The vast majority of the people that teach and practice these forms would be better off doing aerobics or some other sort of body work or new age health dance, than to try and progress with these Wushu style forms. These wushu forms rely on gymnastic presentation instead of martial application. They sacrifice both the development of internal energy and fail to follow natural movement. By natural movement I mean movements that follow the wave dynamics of crest, body, and trough, and shapes that proceed sequentially through hand, eyes, body, and foot. Taijiquan Essentials: 7. Upper and lower follow one another. Upper and lower follow one another is what is referred to in the saying from the "Taijiquan Classic:" "It is rooted in the feet, issued by the legs, governed by the waist, and expressed in the fingers. From the feet, to the legs, then to the waist, always there must be complete integration into one qi."